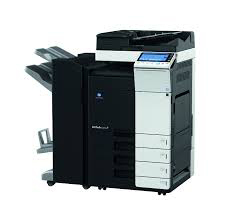 We offer a wide variety of color Konica Minolta copiers. Click here to view the comparison of all color copiers. bizhub C3110The bizhub C3110 Color All-in-One Printer puts color power as close as your desktop: brilliant image quality at up to 32 ppm, Emperon print controller, low per-page cost and optional Super G3 fax, all in compact, space-saving design that’s a perfect fit for mixed MFP and desktop environments. bizhub C3350For a high-quality, low-cost color solution in networked MFP environments, the bizhub C3350 color multifunction laser printer is an ideal choice -- with 35 ppm output in color and B&W, touchscreen convenience for ease of operation and built-in Emperon printing with PCL and PostScript emulation. 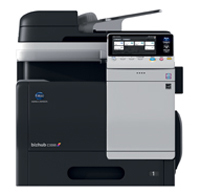 bizhub C3850Brilliant color quality, fast 40 ppm output speed and low cost of ownership make the bizhub C3850 color laser MFP a valuable addition to mixed networks of large and small MFPs -- and built-in Emperon printing with standard Super G3 fax provides all-in-one productivity for small offices, branch locations, schools, clinics and legal facilities where space is limited. 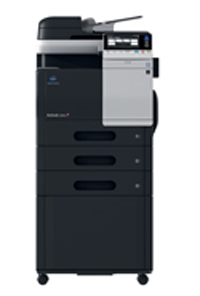 bizhub C224eSmall and mid-size businesses demand higher productivity -- and you can count on the bizhub C224 to get the job done, with 22 ppm output in color and B&W, built-in print control, INFO-Palette design and optional single-pass dual scanning. bizhub C284eThe bizhub C284 can replace underutilized desktop laser printers with high-speed MFP performance to increase your productivity. Outputting at speeds up to 28 ppm in color and B&W, this multifunction printer never slows you down. It keeps you ahead of your competition with its built-in print control, INFO-Palette design and optional single-pass dual scanning. 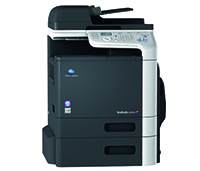 bizhub C364eCount on the bizhub C364 color laser multifunction printer for high-volume color and B&W document traffic. Stay ahead of your business needs with built-in print control, INFO-Palette design featuring a 9” touchscreen color panel with downloadable productivity apps, and optional single-pass dual scanning handling up to 160 originals per minute. bizhub C454eThe bizhub C454 multifunction printer fax copier puts more speed, quality and productivity at the hub of your business. 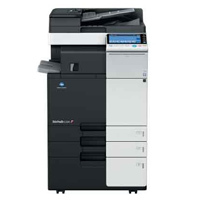 Experience fast output, single-pass dual scanning, built-in print control and Palette design featuring a 9” touchscreen control panel with the Konica Minolta multifunction printer fax copier at your business’ fingertips. bizhub C554eThe bizhub C554 helps you keep ahead of high-volume workloads, with fast print/copy output in superior color and cost-effective B&W. Get standard single-pass dual scanning, built-in print control and an innovative INFO-Palette design featuring a large 9” control panel with touch & swipe operation.